Winters in the Wichita area can be cold and snowy, and the team at Accent Lighting is here to help make sure your season is safe and bright. When it comes to exterior lighting, it’s important to check your fixtures before the first snow falls, but what about after the flakes begin to come down? Maintaining your outdoor lighting in winter doesn’t have to be a challenge, and with the right approach, you can keep your fixtures shining bright all season long. Be Careful Where You Scoop! As you’re outside scooping snow off of the sidewalks and the driveway, be mindful of where your shovel is and where you’re pushing the snow. If you have ground-level landscape lighting or garden fixtures along your sidewalks and driveway, it can be easy to snap them off or break the bulbs with your snow shovel. If you use a snowblower, be careful of where you set the tires, as well as where you blow all of the snow, since you won’t want to cover up the lighting in your yard. If something does break, then we can help you find the proper replacement. 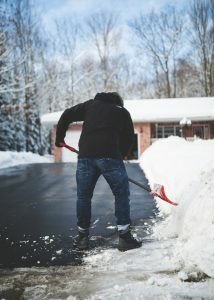 Once the snow begins to fall, your first priority is clearing the walkways and driveways that lead to your house. You want people to be able to walk up to the front porch without fear of slipping on snow and ice. However, once the sun sets, it can be hard to see those patches of ice that can pose a slipping hazard, which is why it’s important to clean snow off of your outdoor lights. Covered or smudged shades and lenses will impact a fixture’s ability to light the way, and the last thing you want is for someone to miss a step or walk on a spot of ice because they couldn’t see where they were going! Kansas winters can often mean blizzards that knock out power for a day or two. If and when this happens, it’s important to check your exterior lighting to make sure everything is working properly. Any fixture that’s wired into your home’s electrical system may need to be reset, and your landscape lights may be controlled via an outdoor transformer. You’ll have to reset the timer inside the transformer so that your landscape fixtures turn on and turn off at the proper times. The days are shorter during the winter, which means that your outdoor lights will be on longer during the evening and the night. If you’re worried about your exterior fixtures using too much energy throughout the season, then replace any old bulbs with more energy-efficient options, such as LED bulbs. You may also want to add bulbs with more lumens so that the lights are brighter in the cold dark of winter. This can be especially beneficial for the spotlights or motion sensor lights on the outside of your garage that help you see as you’re pulling into the driveway on a snowy evening. At Accent Lighting in Wichita, we’re here to make sure you always have the right exterior lighting solutions. We hope that the tips in this post will help you keep your outdoor lights shining bright throughout the winter, and that your property remains safe for all who live there or all who visit for the holidays. Our store is open Monday through Saturday, and you can call us at (316) 202-6300 or fill out the form below before you visit. We’ll gladly answer any questions you may have.